Comments Off on Back at it. Verdict is in on the new laundry room. 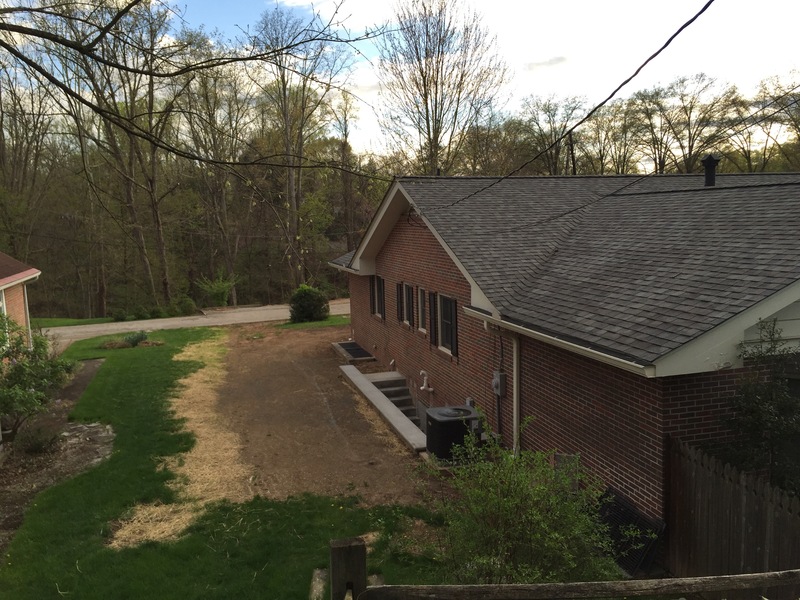 When we began the whole “let’s build a garage and move our driveway” project, we decided to check into the cost of adding a new laundry room in the old garage space. The quote came back last week and we decided not to move forward. It wasn’t a “we wavered back and forth” NO. It was a BIG FAT NO. The main issue is our plumbing. We would have to jack hammer the floor of our current garage and then dig a trench all the way to the opposite side of our property (about 100 feet) in order to tie into the main sewer drain. 5K just for plumbing. Are you kidding me?! Not happening. On top of the 5K we had to add up the cost of framing, electrical, dry wall, tile, cabinets, sinks, fixtures, etc… which wasn’t awful, but then when you combine that with the exterior changes that would need to be done (take out the current 2 car garage door, brick up that wall, add a gas line (our dryer is gas), and frame out/buy/install a new single car garage door) it became insane. It’s just waaay too much money on something that probably won’t add much value to our house. Its minimal square footage so it wouldn’t add anything in that aspect either. Return on investment is Just. Not. there. It’s sad to think I had such a beautiful space designed in my head (and on Pinterest) that won’t come to fruition. But in all honestly I would rather spend that much money on something a little cooler than a laundry room. I don’t even like to do laundry. So it’s final. 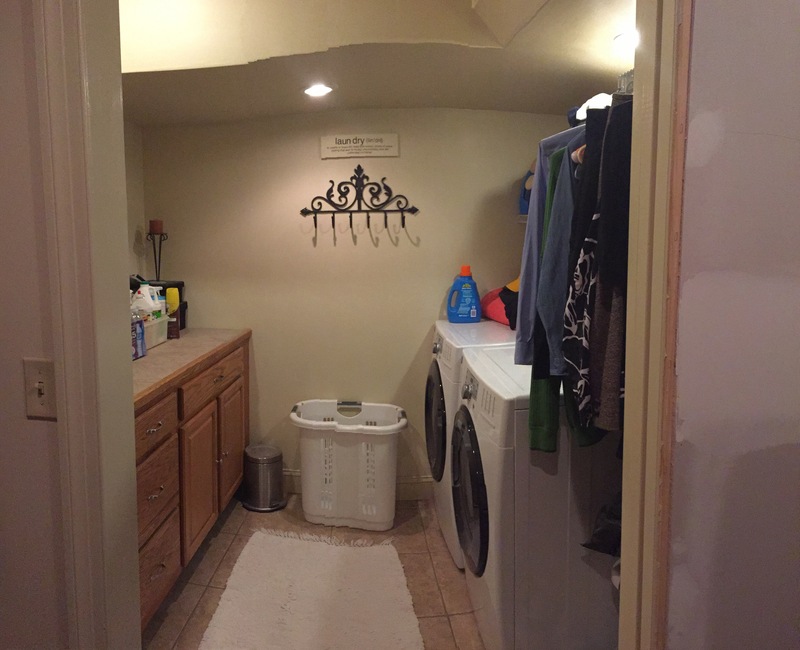 We will continue to use our small but highly functional laundry room in the basement. And I am totally fine with that. I’ve never thought it was a bad space. It’s actually pretty glorious compared to the unfinished laundry room we had at the old house! 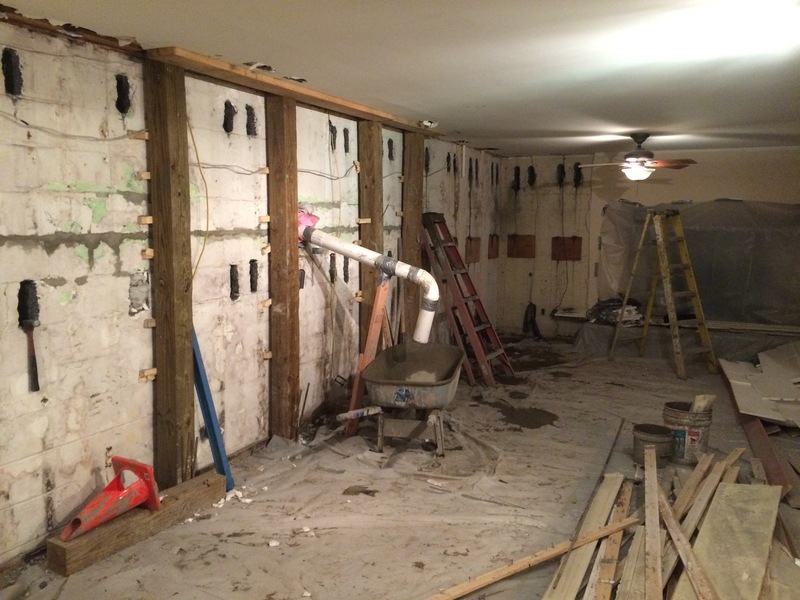 During the 5 months of foundation repair I had the grand idea to take out a small wall in the basement. 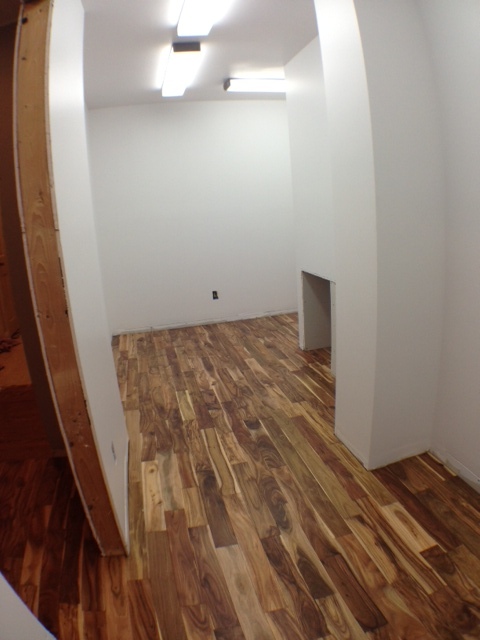 It separated the 2nd basement bedroom from the living space and work shop. 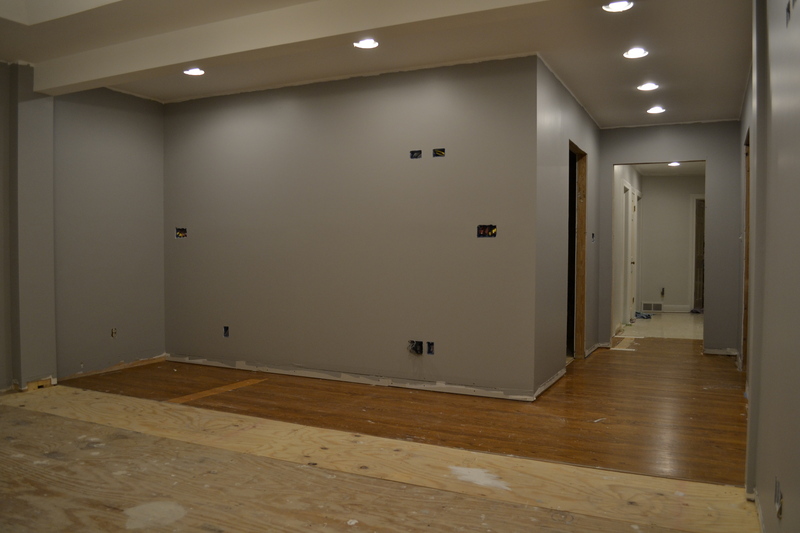 We knocked it out, had our electrician put in an extra recessed light, and the contractor dry walled it. 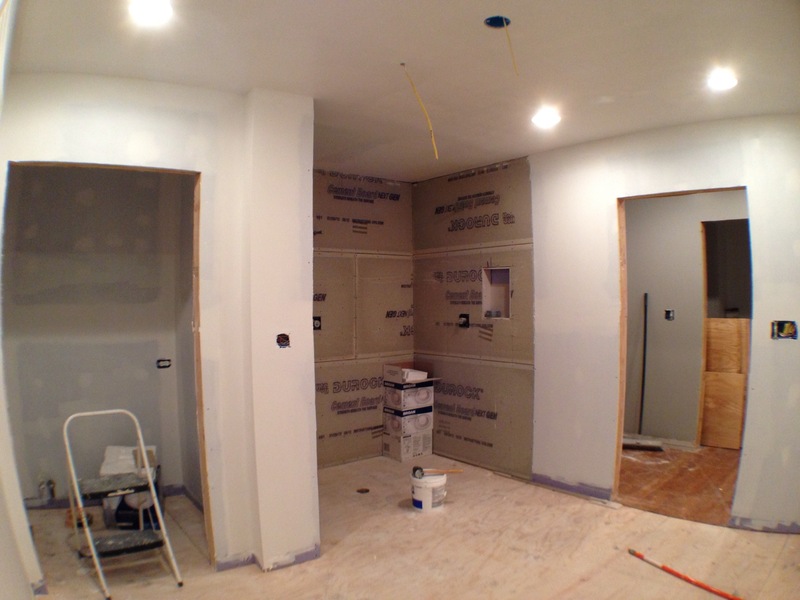 It really opens up the space where the laundry room is….now if we would get our but into action to wipe down the walls, get to priming, and lay some missing tile…. So what does all this mean? It means we are going to have a ridiculously large 4 car garage. 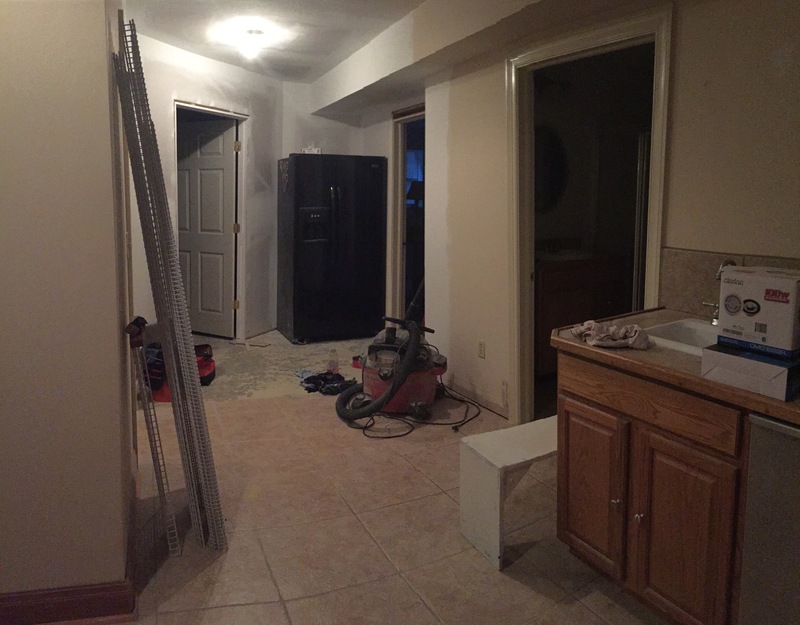 We still will hang some cabinetry and move our basement fridge into the space, there just wont be a washer and dryer, or walls to keep it all company…And the dogs will continue to get bathed in the 1965 blue guest bathroom upstairs 😜. On a side note, I started cleaning up the mess our foundation guys left in the basement. I spent 5 hours scraping dry wall plaster and concrete from our tile floors in the guest room, storage room, and bathroom downstairs. After I mopped the floors (several times) and wiped down the walls I was able to get a coat of primer on all the walls and trim. Next up? Tackling the rec room. that space is huge and will require much more motivation. 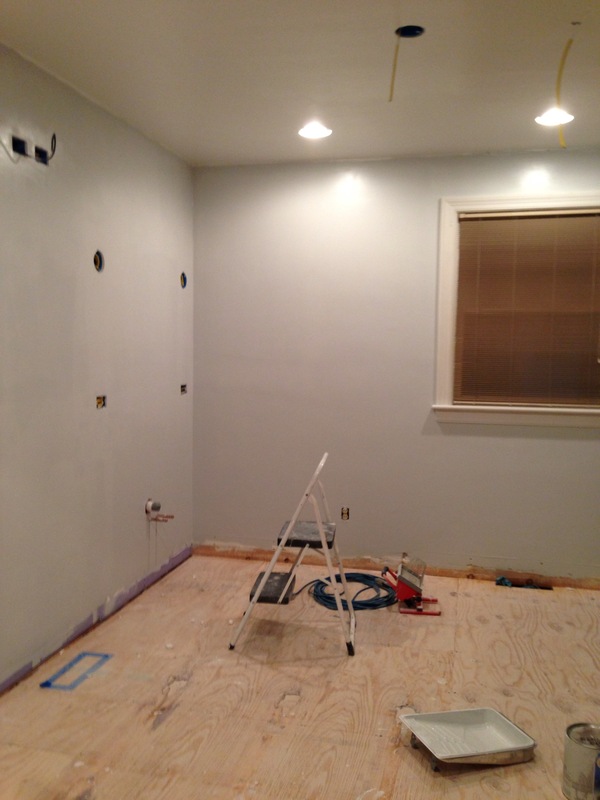 Then paint colors. Oh what color(s) to paint? Painting is my (really weird, somewhat therapeutic) happy place. The garage addition is 28 feet long. That’s a lot of feet. 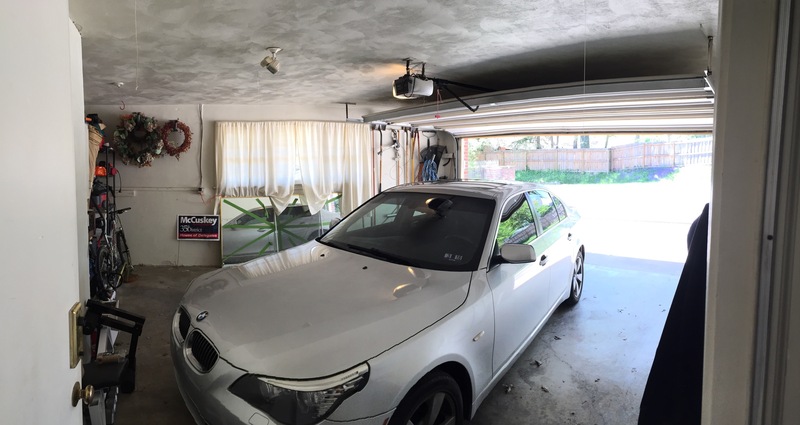 It’s about 4-8 feet longer than a normal garage. Go big or go home, I guess…. 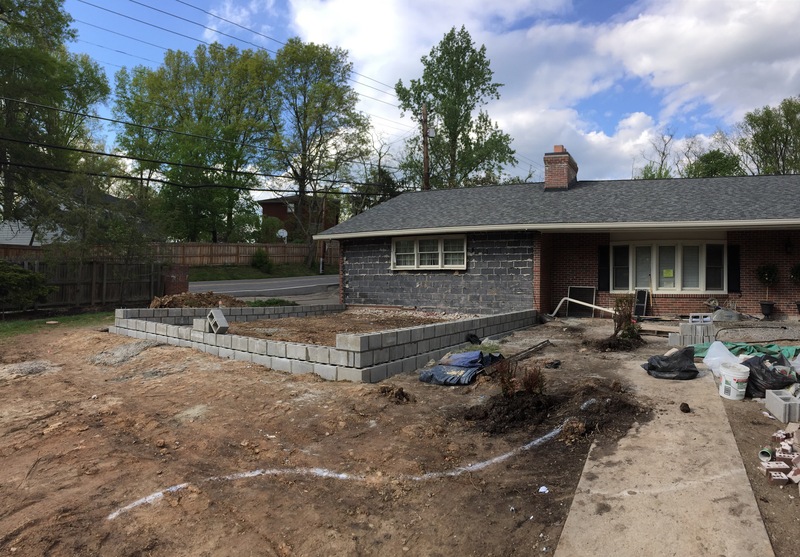 Once the wall gets knocked out between the existing garage and the new addition, the entire garage will be approximately 48 feet deep. Crazy Big. Our initial plan was to have a space big enough that we could also store our boat in the winter. I guess we imagined cleaning and tinkering with it (?). That will never happen. Now enters crazy idea #108. Should we try to add a laundry/mudroom to this space?? Currently our laundry room is in our finished basement. It’s small, but it’s a nice space. Nothing’s really wrong with it except it’s in the basement. I’m always thinking re-sale. And it would add a lot to this house if there was a main floor laundry room. 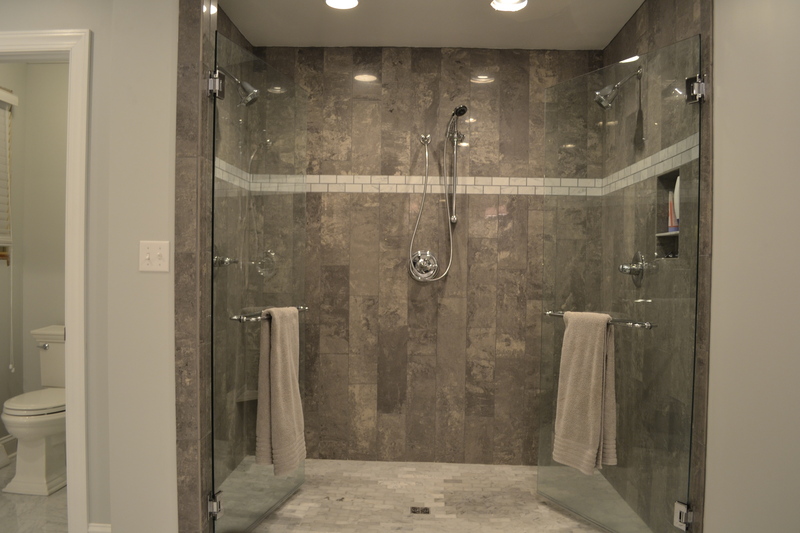 When we designed our master bedroom we made sure to allow for 36” doorways to keep it handicap accessible and designed the shower without a curb for the same purpose. 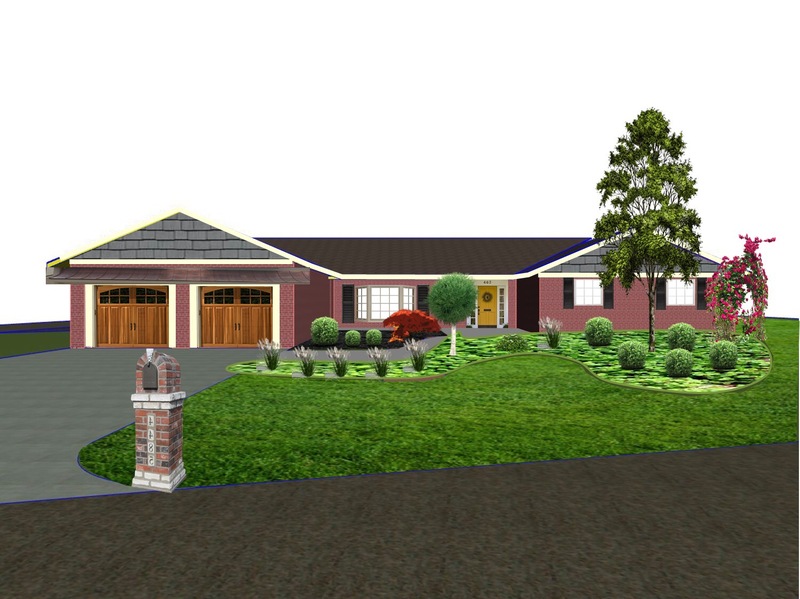 If we add a laundry room to the current garage it would essentially make our house almost 100% handicap accessible, therefore appealing to older home buyers or families with small children. 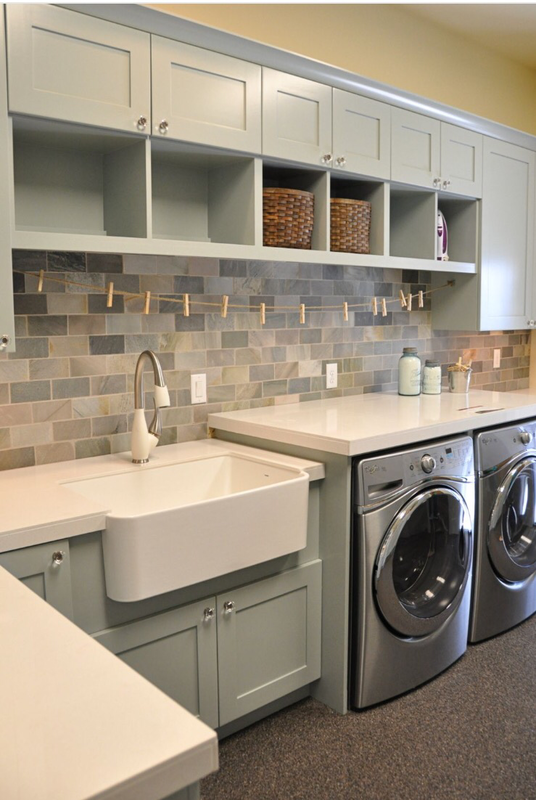 When we met with our contractor, who is Roger Spaulding by the way (we keep getting asked that question), he let us know adding laundry facilities might be a bigger (which equals more expensive) project than we thought because of drainage. If we have to tap into the drain on the other side of the house it will be a forgotten project. In my head this laundry room will consist of white cabinetry to match the kitchen, marble countertops, a glass subway tile backsplash, a ridiculously large white apron sink to wash the dogs, a coat closet (which already exists in the space), and room for our extra fridge. 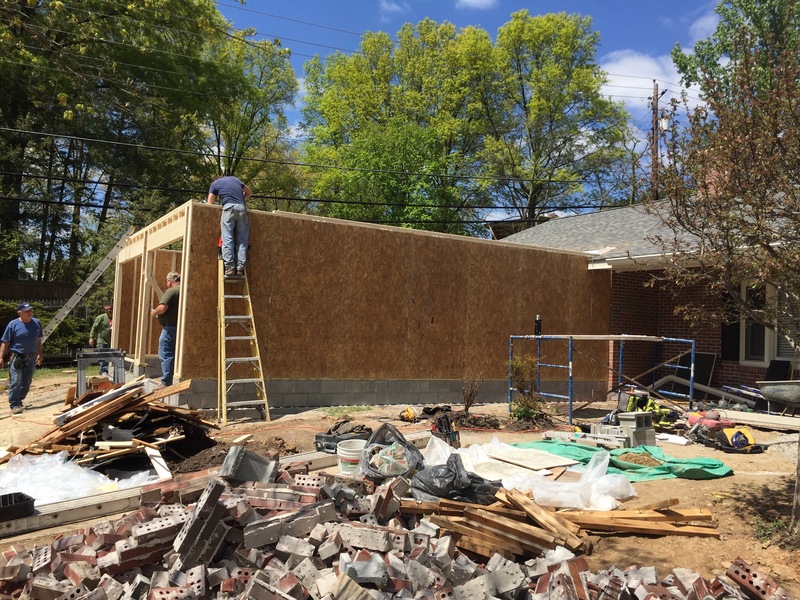 The plan, if it happens, is for the contractor to complete the shell (including drywall, electrical, and plumbing) and we will finish the space ourselves. But obviously that won’t happen until we hear about drainage. So there’s that. 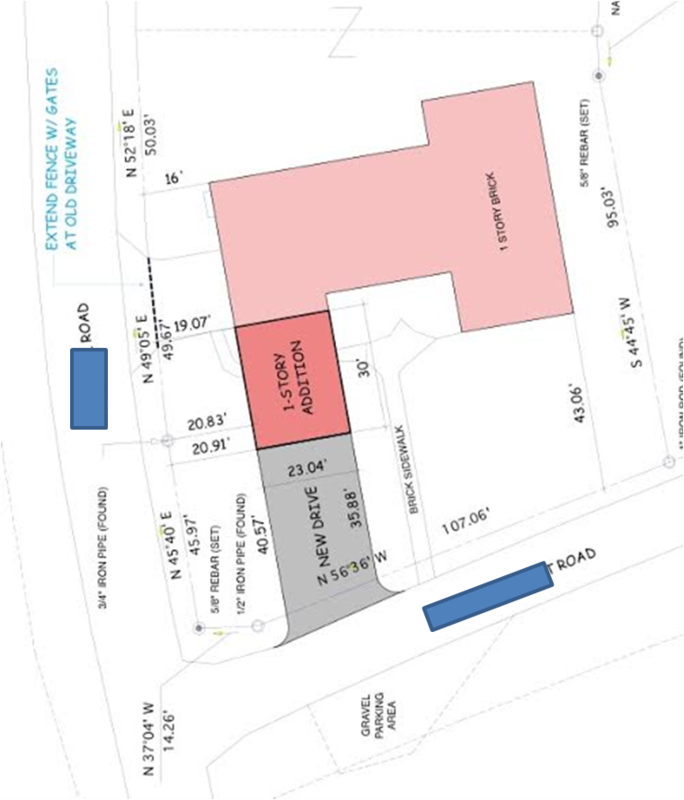 On the outside, we have 2 separate car bays, both over sized at 9’x7’. The garage doors will be carriage style in a walnut finish with black wrought iron hardware and an arched window design up top. This is probably my favorite element of the project. And more costly than I imagined. We will purchase 3 more light fixtures to match the one next to our front door and they will be placed between each bay. I had considered placing them above each door but decided to stay more traditional. Above the garage doors there will be a metal awning supported by decorative corbels. Originally I had planned copper, but now I’m thinking a black/brown metal might tie into the black shutters nicely. Luckily, one of my best friends own a metal roofing company so I’m sure he’ll give me the family discount …haha. On the gable (which will mimic the other side of the house) we will add Hardie Shingle siding which will hopefully break up all the brick and add a little texture. The Hardie Shingle siding will also be added the gable on the other side of the house for balance. As of now I plan to paint the shake siding a medium grey (if it doesn’t come in the color I want). 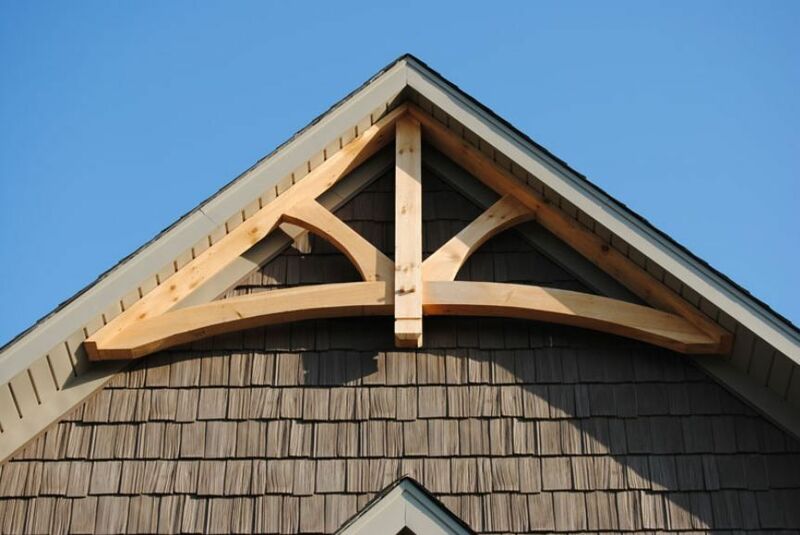 I’d also like to add some type of decorative trim at the very peak of both gables. 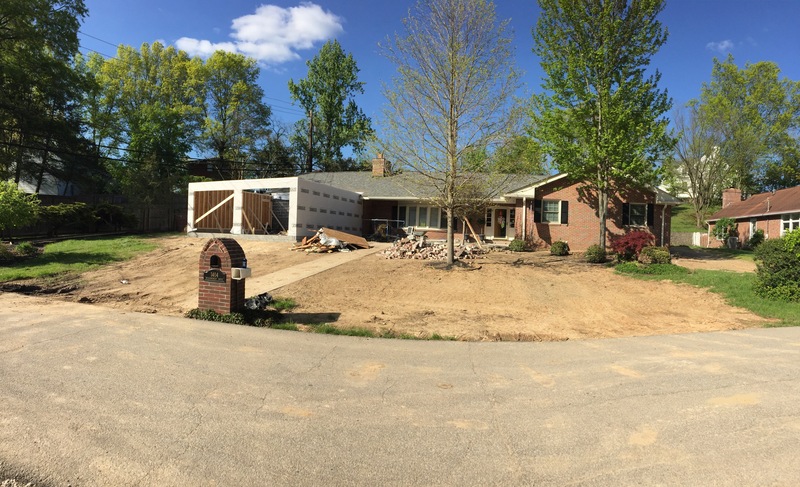 The side wall of the garage (facing the house) will have 2 windows (we are re-using the ones from our existing garage) centered in the middle. The ground space in front of the windows will become a large flower bed, butting up to the patio and walkway. I imagine building some kind of trellis for climbing plants to grow on either side of the windows. We also plan to transplant the Japanese maple that the foundation workers tried not to destroy/kill somewhere in this area. The other side of the garage (the side facing the busy main road), will remain mostly the same. Depending on the laundry room outcome, this space is still a big question mark. If we can build the laundry room we will remove the existing 2 car garage door and install a single garage door to match the ones out front. If the laundry plan goes kaput, then nothing is changing as of now. There are two very large brick pillars that flank our current driveway. They will get knocked out and a fence will go up. This fence will connect the existing fence in the front and back yards. 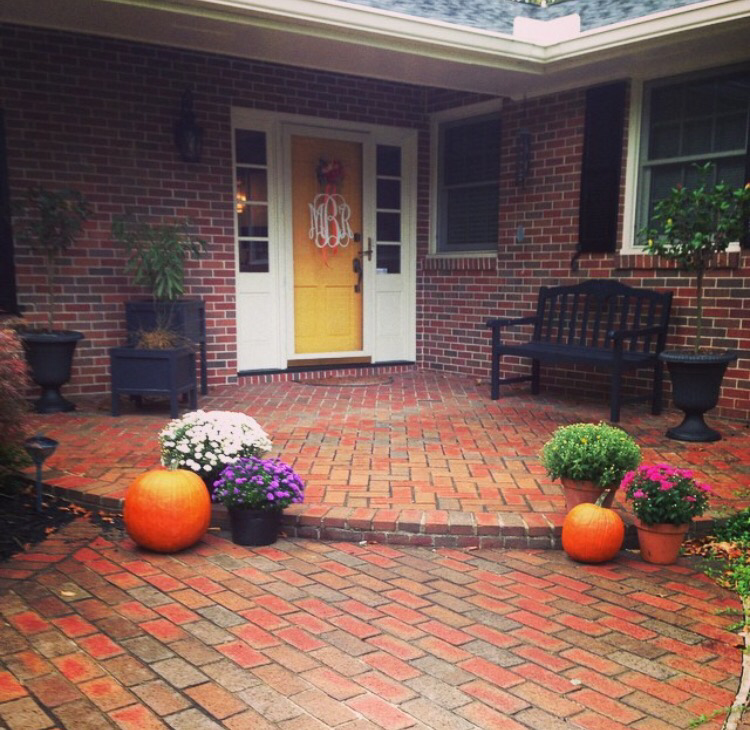 As far as the front porch, it will be slightly larger than before but basically the same design. We will not be replacing the brick. Maybe down the road we might feel like re-laying it, but not now. 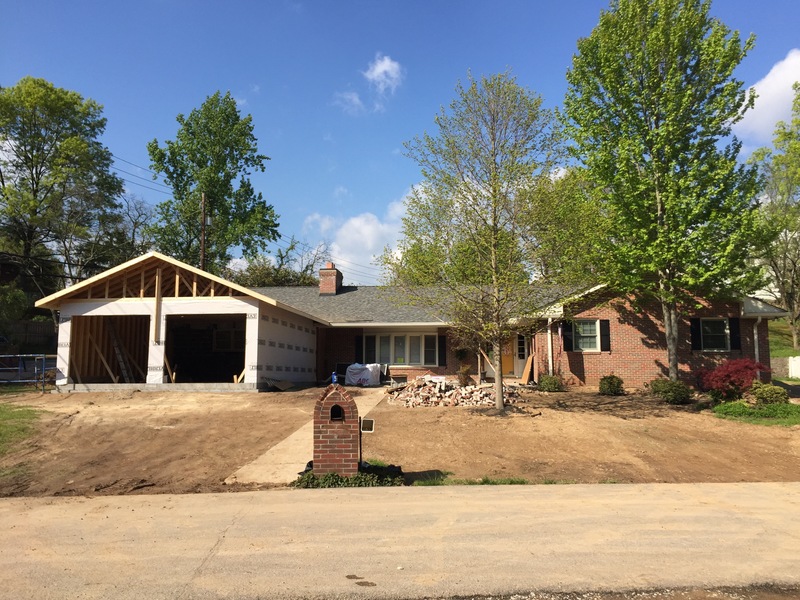 Obviously the new driveway will extend from the street to the garage, but we are also pouring concrete up the side of the new garage wall so there will be plenty of parking. The current flowerbed that’s along the front yard fence will remain, although we will probably plant new bushes. Lastly is the brick. We think we have a match! Of course we won’t know how well it matches until it goes in. It’s the Glen-Gery City Line called “Canyon Blend”. 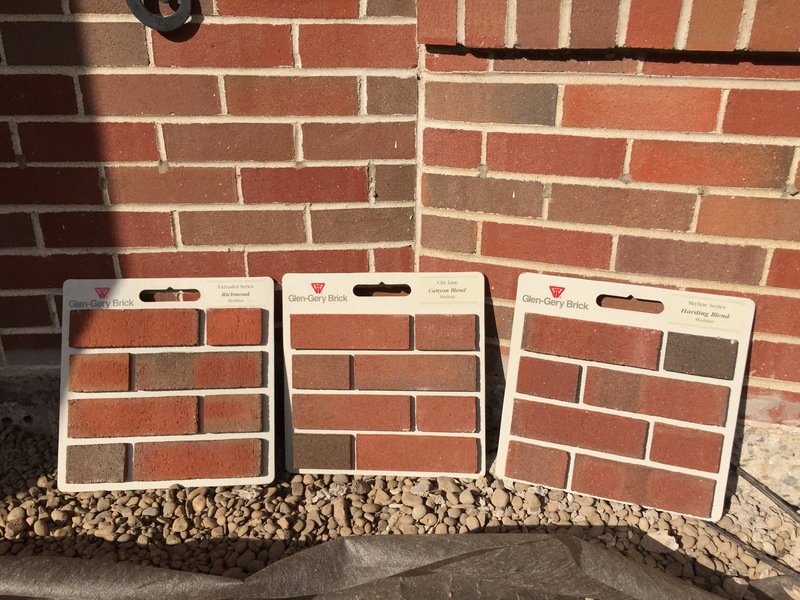 It’s a smooth brick with dark variations. Below are the samples we had to choose from. “Canyon Blend” is the middle board. Phew! It’s a lot to think about but I think it will be so nice when it’s finished. I hope the finished product looks as good in person as it does in my head. Comments Off on Garage Details. finished. complete. done. concluded. over. through. 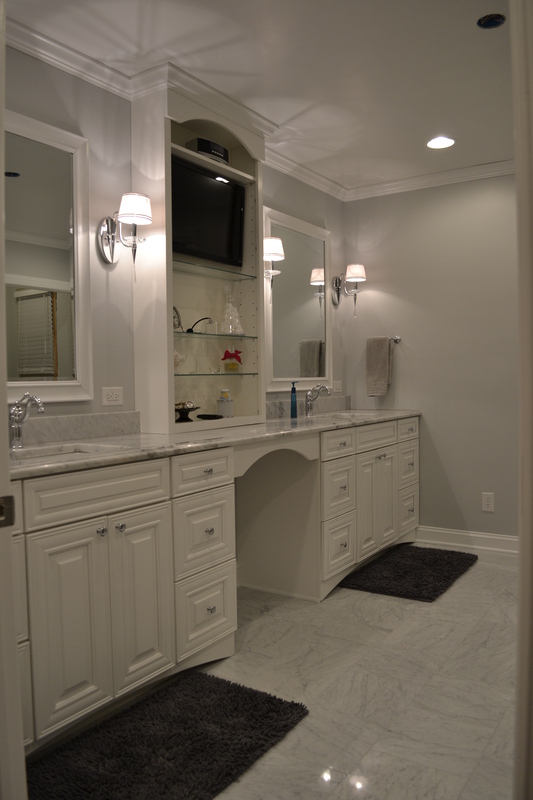 Whatever word you choose, it’s finally time for a formal reveal of the master bathroom at casa da bauer. It’s officially time to let her to walk down the runway, hopefully without tripping. 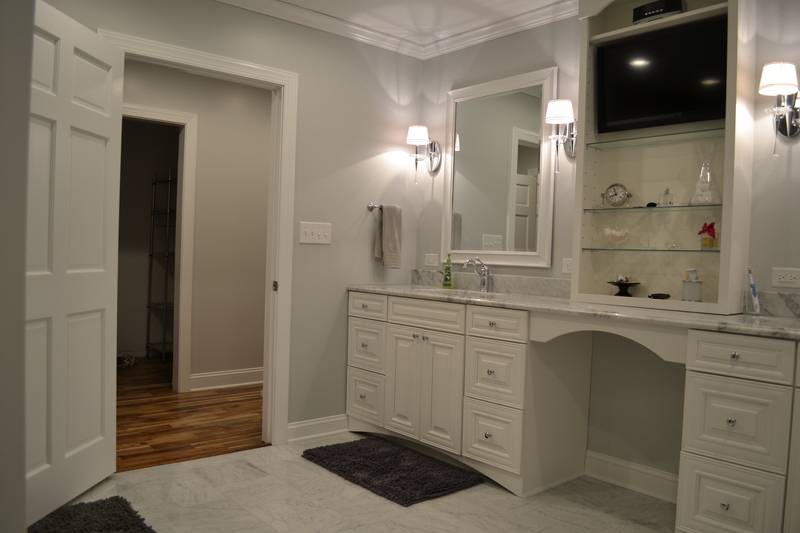 We designed the vanity with with the help of our local cabinet store, Nitro Carpet and Tile. The cabinets span 12 feet across the entire bathroom. They are made of solid maple with a linen (white) stain. The hutch was on my must have list since Ryan requested a television like we had in our first home. The hutch is 36″ wide, 8″ deep, and 60″ tall. 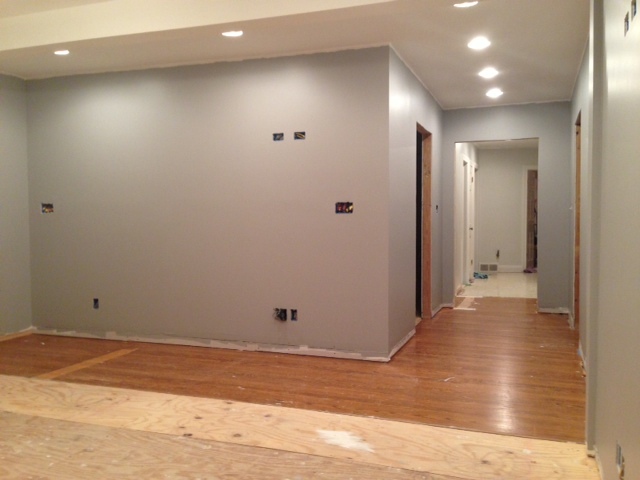 Ryan added extra support for the TV mount and hardwired cable and electrical before we hung drywall. The wall scones are from the Halina Collection at Home Depot and the towel bar is the London Terrace towel bar (I splurged for the 8″ towel bar because I have a bad history with towel rings…they constantly fall off the wall!!!!! …at least for me). We opted to go with the rectangle under-mount sinks. Originally my plan was to go oval. I thought the round shape might break-up all the straight lines in the room, but at the request of Ryan we went the rectangle route (Gotta let him win one here and there). They are the Decolav brand from Home Depot. 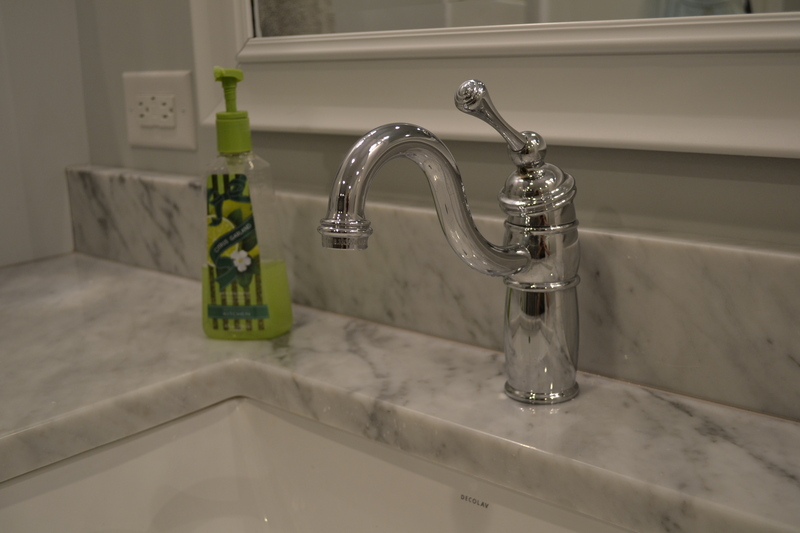 The faucet is the Victorian center-set chrome faucet from Overstock. It’s a single handle design (at the request of Ryan – he has more say than he thinks he does (wink, wink)). The faucet is actually the first thing I bought back in January/February 2013 when this whole remodel mess began. The reviews about installation were awful, but since I knew a plumber was going to install them I figured it didn’t really matter…and I was right, he had no problem (leave it to the pros!). We actually hired a plumber to do about $1,300 worth of work. We needed to move the plumbing for our sinks and add to the existing plumbing to accommodate the 3 separate shower heads in our massive 5×8 shower. 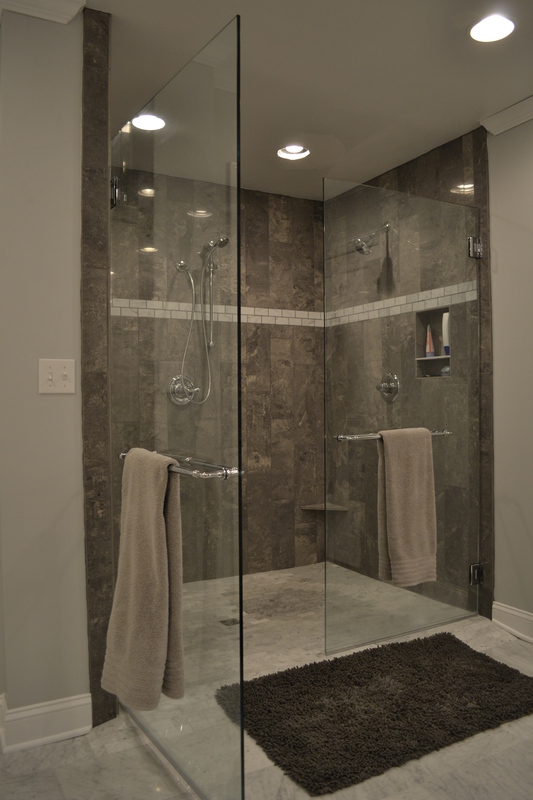 The glass doors are each 36″ wide and 80″ tall, spanning a 74″ opening. They came from another local company called The Glass Guyz (who were awesome, by the way! ), out of Hurricane, WV. We tried to shop local, avoiding the big box stores as much as possible. The hinges and handles are also chrome. We splurged on the upgraded towel bar handle for $50 more per door. All three shower heads are Delta brand, also in chrome. 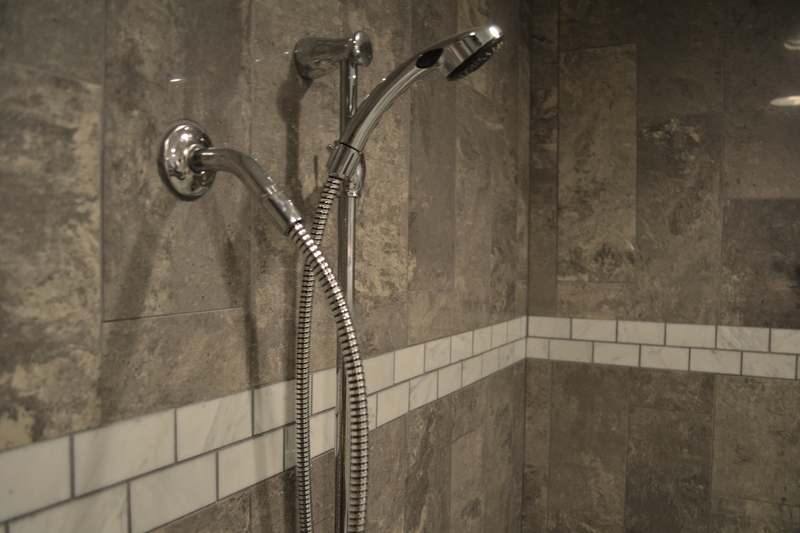 The center shower head is a handshower on a slide bar for easy cleaning or handicap accessibility if something tragic happens down the road….always thinking ahead! 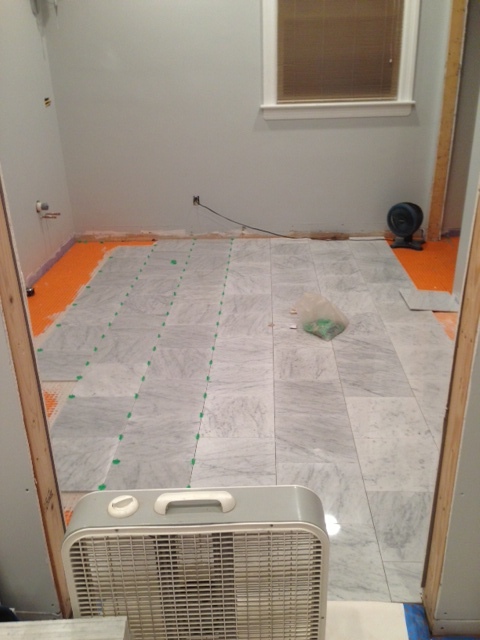 We used 2×4″ Carrara marble in a subway pattern on the shower floor. At first we were concerned the floor might be slick, but there’s enough grout between those tiles to act as a natural anti-slip mat. We also carried those 2×4″ marble tiles to a chair rail on the shower walls. In an attempted to add a little contemporary flair to this mostly traditional bathroom, we laid the 9×24″ grey wall tile vertically. 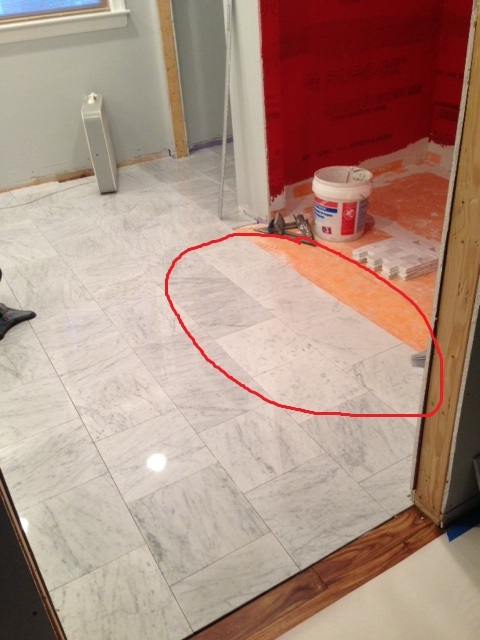 The tile itself is almost the exact opposite pattern of the Carrara marble. It’s a dark grey with light grey veins. Made by Crossville, it’s called General’s Grey. We order both the floor and wall tile online, both shipped without any problems! Lastly, the watercloset. I won’t lie, it was my request. Having the pleasure to stay at several Ritz Carlton hotels as a youth, I was always fascinated with that private watercloset hidden behind a louver door. (I guess interior design has always been in my blood…ha!) 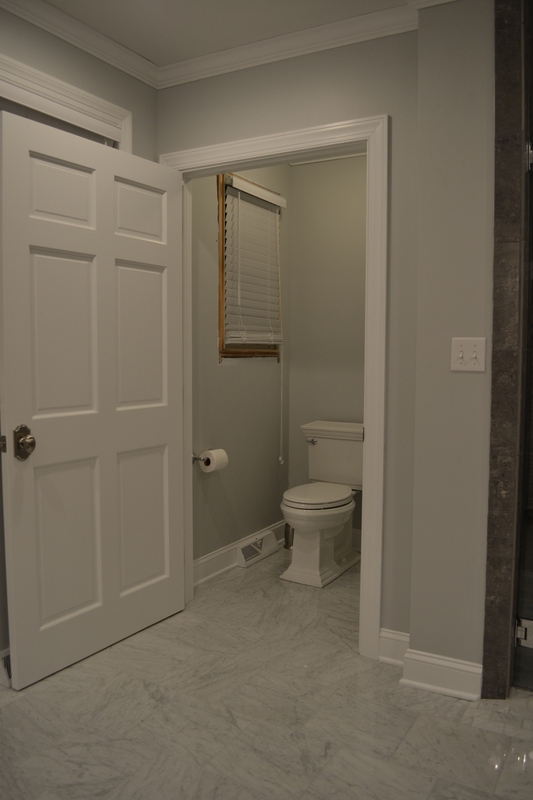 Granted, I didn’t get a louvered door (another win for Ryan), but a fancy Kohler commode with crown molding from Ferguson’s is always a plus. We still have to replace the window sill and add casing around the window when the weather is warmer but if that’s the only thing incomplete on this 9 month renovation, I’ll take it!!! So did we hit it? Did we create the timeless mater bath retreat/classic hotel feel that we were going for??! It’s insane to look back at the past year and the transformation our (not so new anymore) house has made! We plan to put the finishing touches on the bedroom and start the custom built closet system in the walk-in during the next few weeks….we’re moving at the pace of snails, I know. Comments Off on Master Bathroom Reveal! Yep, they’re in! 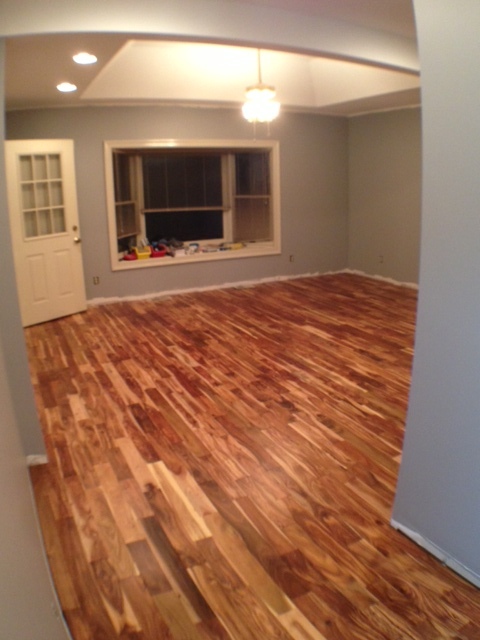 Our twinkle toes are now touching new hardwoods and marble. I can officially say I won the battle-of-the-flooring. Ryan wanted carpet. I wanted hardwood. He likes a soft feeling under his toes, I like the easiest way to clean up dog vomit. Not that dog vomit happens a lot, but it does happen and it’s much easier to clean wood floor (in the dark, at 3am) then carpet. But anywhoo… This is what we were working with in the hall/bedroom. 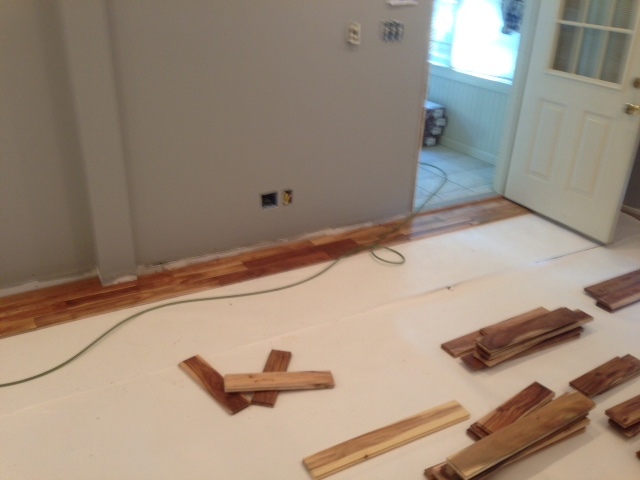 Half of the master contained hardwood flooring that I believe was original to the house. The other half was carpet with sub-floor beneath. Why half and half? Remember that brick wall we torn out? 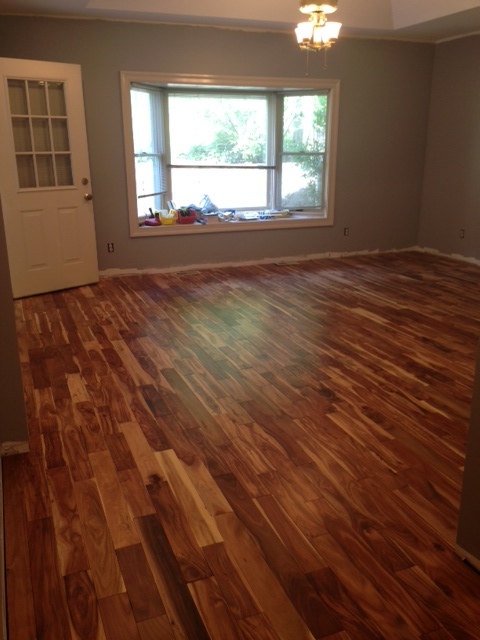 That was an addition by the previous owners, hence no wood floor in that space. I’d like to think I am a very gracious winner. Since I won the battle-of-the-floors Ryan got to choose the hardwood. We headed to Lumber Liquidators just to “look” at their inventory, but of course made a purchase that same day. Ryan chose Acacia. And here’s the reason: It’s known for strikingly dynamic grain and knots (which he loved) and it’s one of the hardest woods in the world (which I loved), so it was good for dogs. Win-win situation. We loaded (and unloaded) 21, eighty six pound boxes of this stuff. Lift with your legs, not your back. 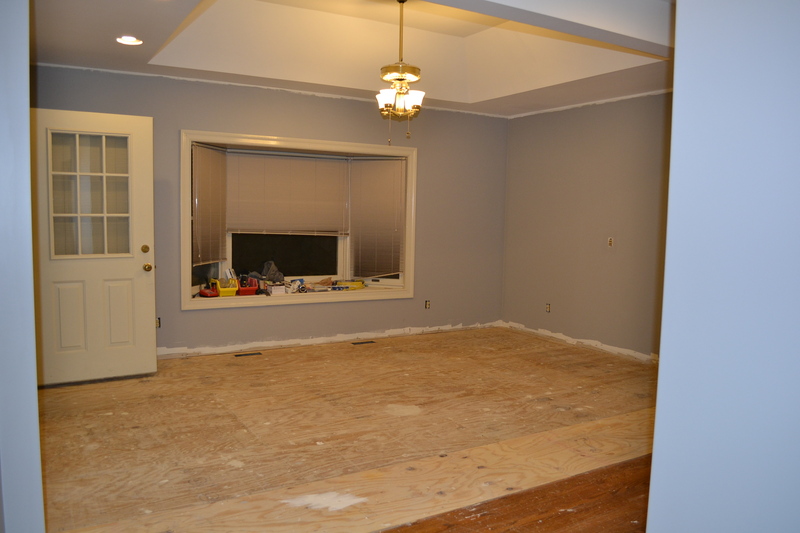 The floor was required to rest for 2 weeks in the house. 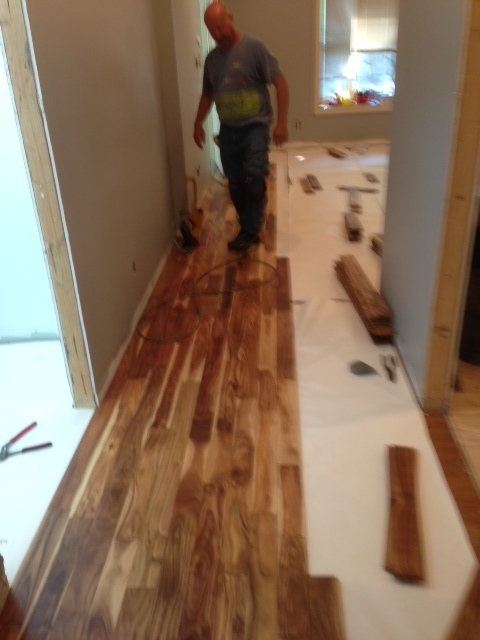 The wood has to acclimate to the humidity, temperature, etc…in your home. 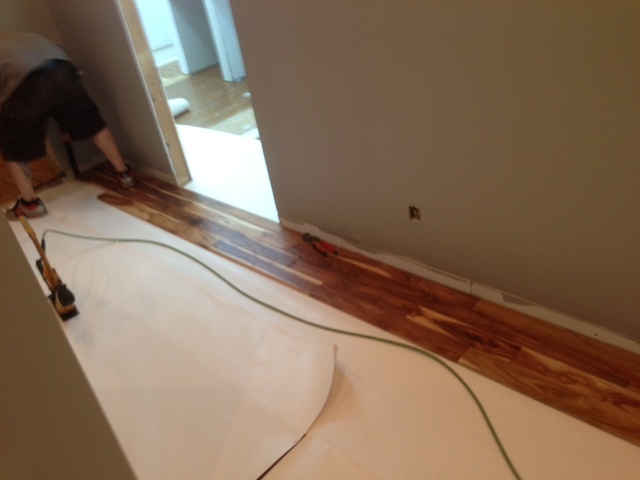 We really thought deeply about DIYing the floors and installing them ourselves but in the end we didn’t want our first hardwood installation to be a 450 square foot test-zone. So….we hired out. 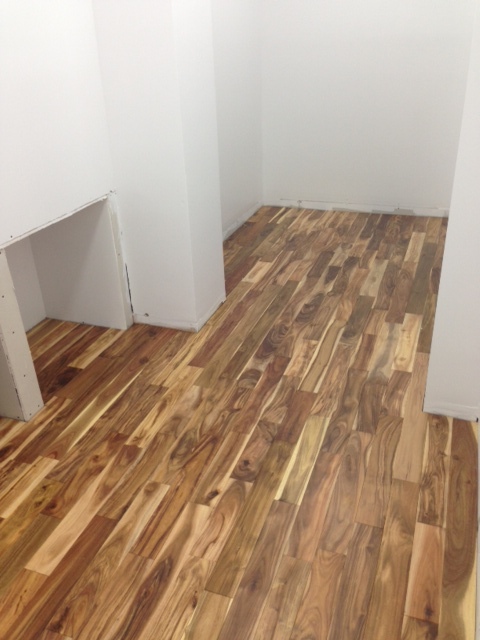 The contractors made our day when we were told they could install the new floors right over the old ones….hurray! We had to make a few patches where old walls use to be (especially in the closet) and we were good to go. The guys were super-fast. They completed the job in a day and a half. Ryan stayed home with them while I went to work. Throughout the first day he teased me with these iphone photos…. We didn’t stand and stare too long. Shortly after our gaze-fest was over we covered them back up. 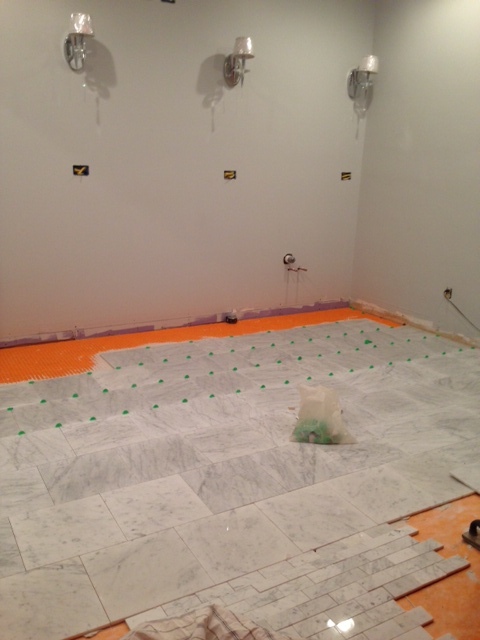 I wanted to keep them protected during the bathroom marble install…which we did DIY. So without a breather we went right back into it. Ryan mixed the mortar and laid the 12×12 tiles while I ran the tile saw. 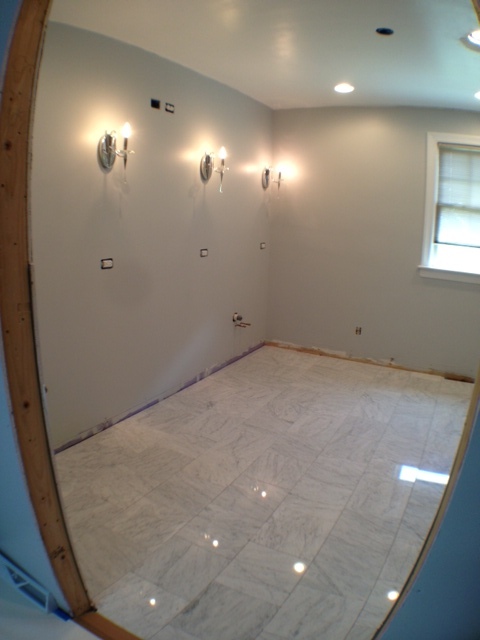 We’ve never worked with Carrera Marble, but it really wasn’t any different than the ceramic tile we’ve laid previously….minus the weight and cost. I began to get a little nervous when the marble started to turn dark grey. Ok, not a little nervous…a lot nervous. The reason I picked this certain “Bianca” marble was because of how white it was and how grey the veins were…eek! After a little googling, I found out this porous stone soaks up all the moisture in the mortar when it’s laid but will eventually dry out. So we turned on a few fans to help the process go a little faster. Issue resolved. Since I share the good and the bad, I’ll admit to one little snafu…. When we first started laying tiles we kept pulling from the same box…BIG MISTAKE. We were supposed to randomly pull from all the boxes (which we knew) so the tiles are laid in a random pattern. It just so happened that that first box contained pieces that were more “white” than “veiny”. We noticed this issue fairly soon into the process and immediate started rotating tile. 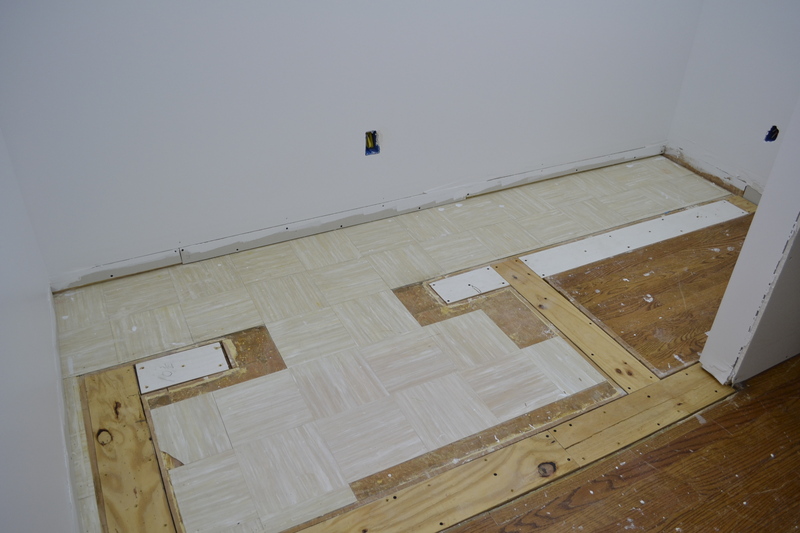 We lived with the floor for a few days, but Ryan decided those first 7 tiles needed to go. It was like staring at a bunch of misfits. Once everything was completely dry (about a week) it was time to grout and seal. 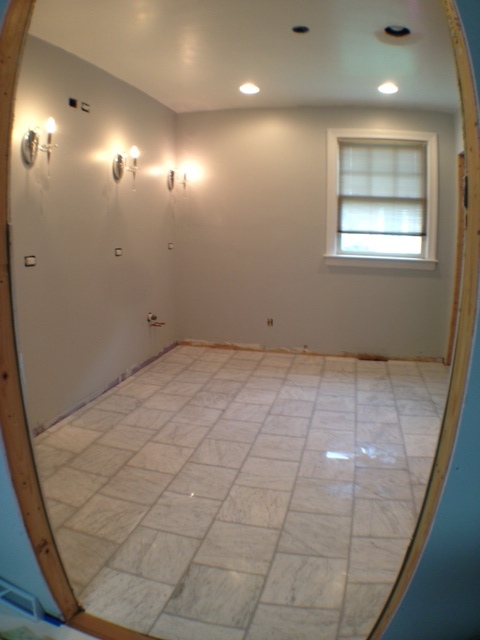 I used Mapei brand unsanded grout from Lowes in ‘warm grey’. To be honest, I’m kind of disappointment in the grout. It looks nothing like the color on the bag. When it dried it was almost white, not the warm gray the bag advertised. 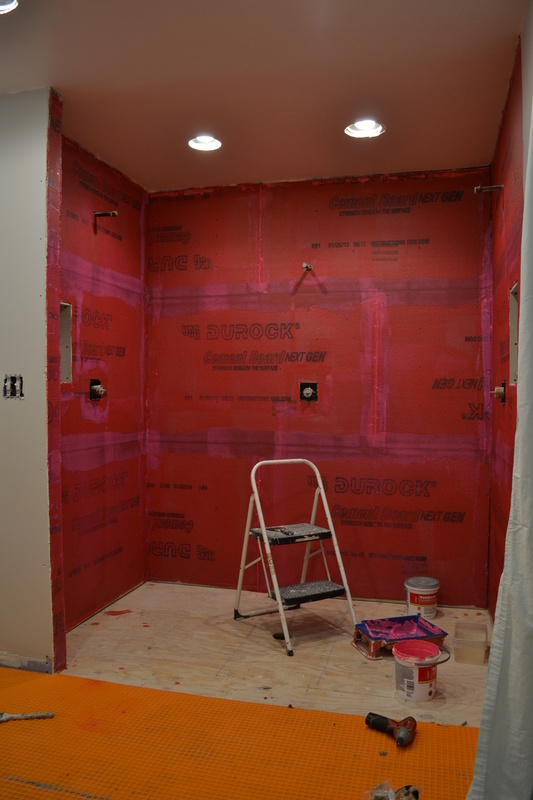 We are definitely going to use a different color on the shower walls. It was dark when wet which led me to believe it would dry a warm grey. After a few days of dry time, it was finally time to seal-her-up. The online reviews said to use standard stone sealer, but I decided to invest in the more expensive “DuPont Premium Stone Sealer”. More expensive = better, right?! Not sure if that theory will apply to our marble, but we’ve put so much hard-earned dinero into this project, why skimp on $40? I don’t have any pictures of the sealing process because I was by myself, but It. Took. Forever. I think I started at 6pm and finished around 930pm. I did two coats and applied it with a roller, per printed directions. It wasn’t hard, just time consuming. And I was trying my best not to ‘seal myself into a corner’. Maybe one day in the near future I’ll break out the Nikon again and stop taking iPhone photos…sorry they are all so grainy! oops. #blogger_fail. 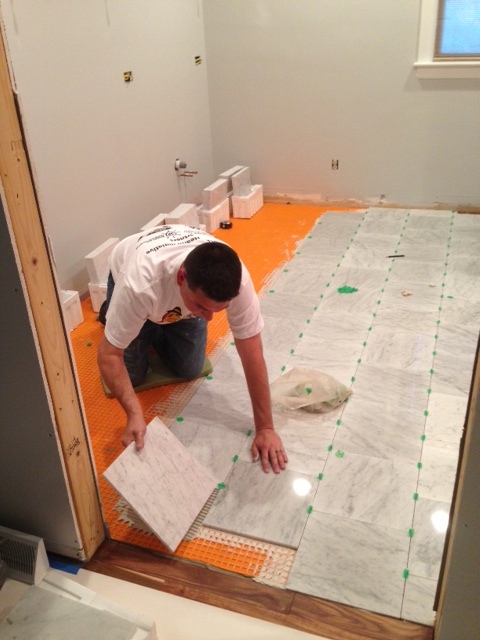 There’s this whole new system in waterproofing bathrooms now-a-days…It’s called the Schluter System. 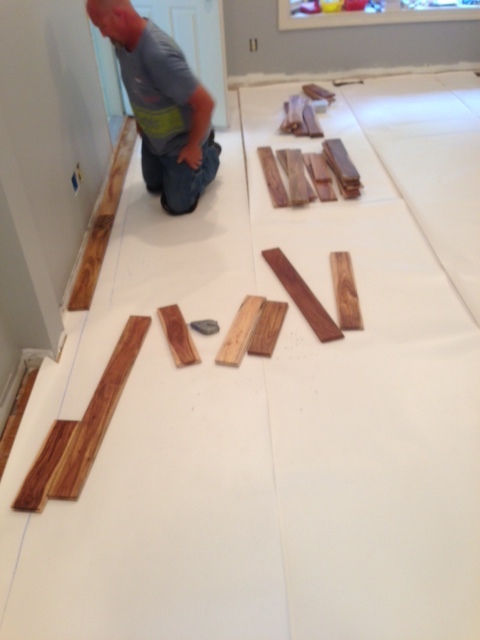 Our carpenter Al, schooled us on this nifty new process. 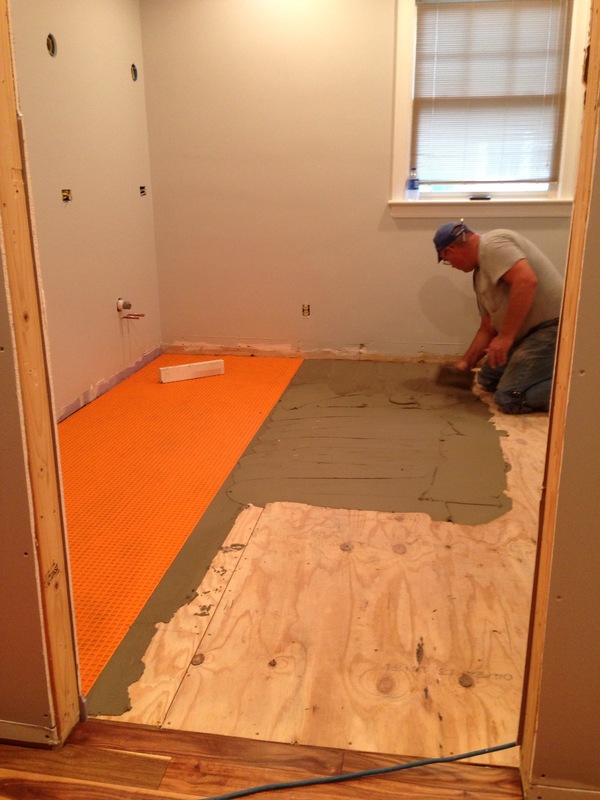 Back in the good old days (like 7 years ago) when we did our first master bath, it was all plastic sheeting, cement boards, etc… Now it involves rolls of bright orange plastic called Ditra and it’s applied with mortar. According to the website it’s a polyethylene membrane. This fancy stuff is for sale at Lowes and Home Depot, but we ended up getting ours from the local flooring store, Nitro Carpet and Tile. It’s supposedly the state-of-the art water proofing system. It’s light and airy…reminds me of a breakfast waffle (but not near as tasty). 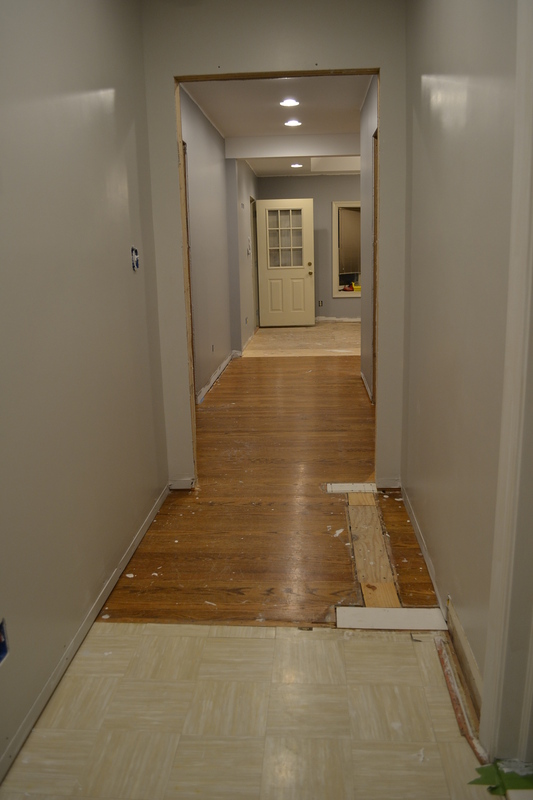 Before the Ditra could be installed we had to remove the old (original hardwood floor). 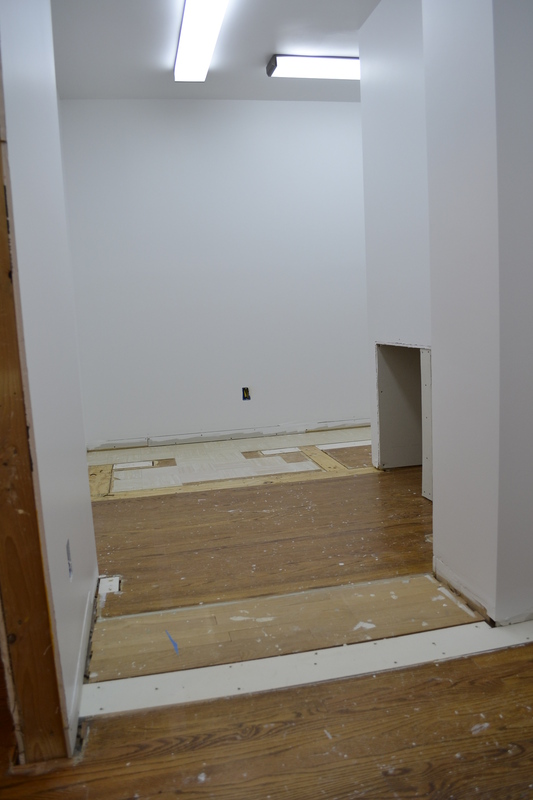 We then screwed in two layers of plywood to get the floor back up to the height we needed. It looked fairly easy and I have no doubt that we will do it ourselves if when we re-do another bathroom. Here’s the gist of it: Mix motar, plop mortar on plywood, spread evenly with flat trowel, lay Ditra on top of mortar. Boom. Oh yeah, he smoothed over the entire orange surface with a piece of 2×4 so it was level. Boom. 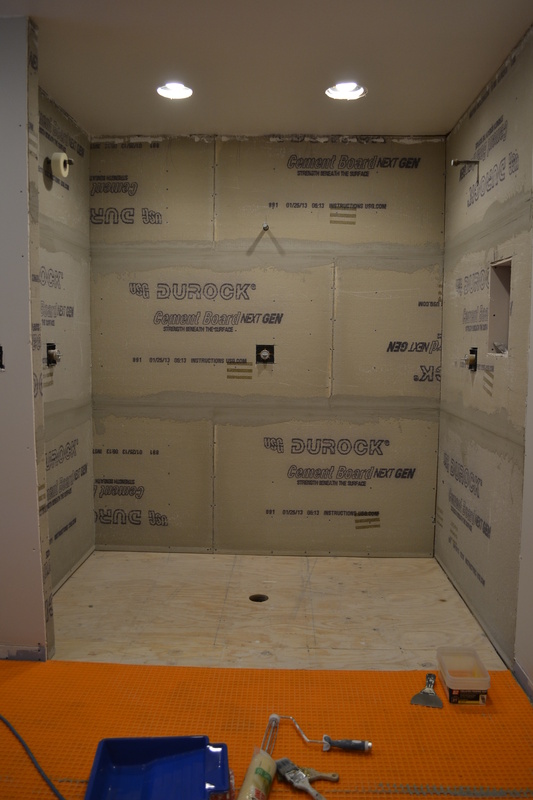 Now for waterproofing the shower, we were supposed to use Kerdi panels on the walls, also a part of the Schluter system. Of course the ceramic wall tile we bought was not recommended for use on Kerdi panels. So we went all old school in the shower and used good ole Durock cement board and mortar. To waterproof the Durock, we used a product recommended by my hair stylist Esta (who was doing a bath remodel at the same time….she’s finished though, go figure). It was called RedGard. It was only available at the Home Depot and it was a little pricey, but it was a fabulous and easy process. 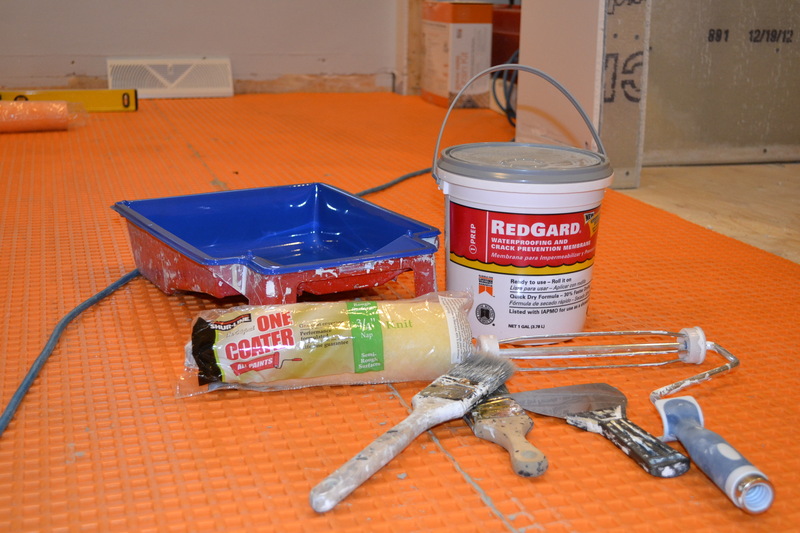 Supplies needed: Paint tray and liner, unused 3/4″ nap roller, and old paint brush….that’s it! It was just like painting a wall, except it was really thick. You apply the pink goop with a roller or spackle knife and that’s it. 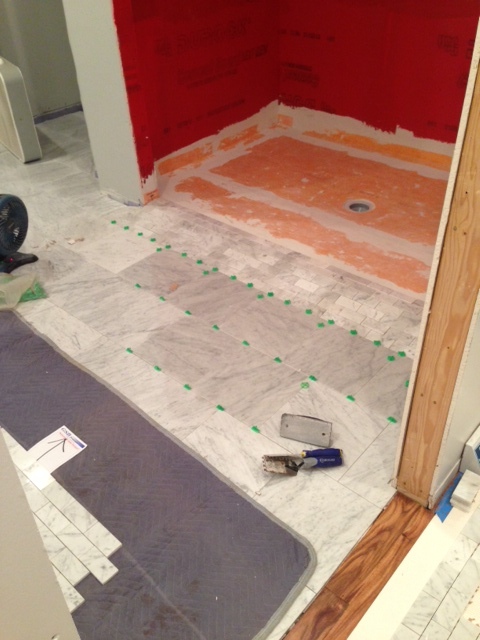 Once the waterproofing was completely dry we could move on to the shower floor. I’ve traveled an unusual amount this summer. There were several weekends I left Ryan and Al to do the dirty work while I frolicked in far-away cities with sorority sisters. 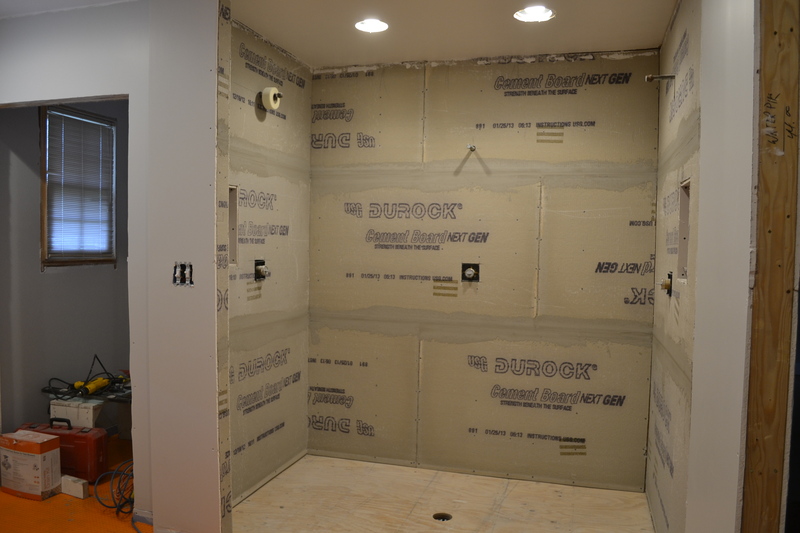 One of their projects while I was away included the installation of the shower pan, It was also part of this Schluter System….it was called the Kerdi Shower Kit. The pan itself was a styrofoam-like material. It wasn’t large enough for our 5×8 shower so they ‘packed’ cement around the outside edges, making sure it sloped down towards the pan/drain. I checked all my photos…nope, not a single picture of this. Use your imagination….or google it. 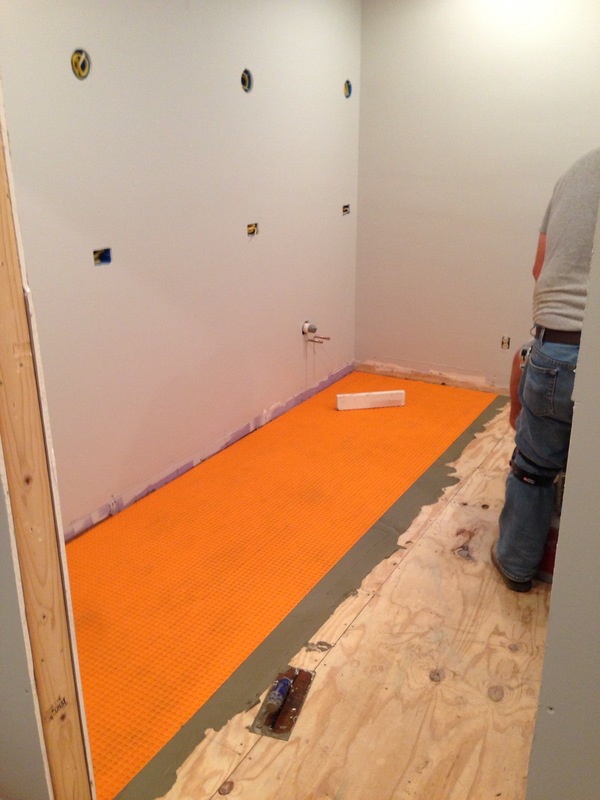 In comparison, we really liked working with the Schluter System in the bathroom. It seems like a fool-proof way to waterproof any bathroom. 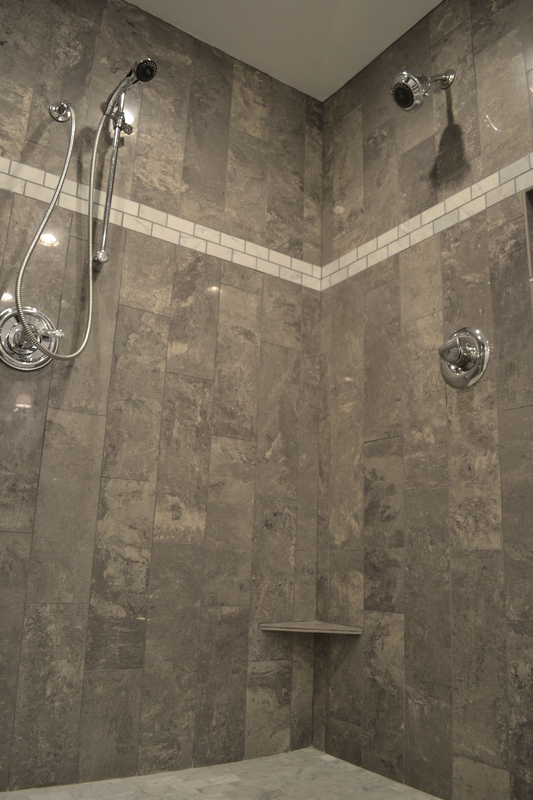 We’ll let you know after we take our first shower…but we would need tile in the shower before that could happen! One day at a time…..right now we are focusing on working the reno a few days a week and enjoying the boat and the golf course all the other days. Summer will be over before we know it, we need to enjoy some of it……………………………………….. Comments Off on Getting Schluter’d.